I have always wanted to go to York. Well, ever since standing on the underground platform at Finsbury Park on my way to work and seeing a travel poster for it; a train zooming towards golden buildings, bridges and the cathedral. 'Visit York!' was the declarative title, "from £30 return". It never is the price as advertised, normally it is alluring to an indirect train on a Wednesday at 6am, but a few weeks ago I found some very affordable tickets teamed with our 'Two Together' card. So one Saturday we got up relatively early to catch the 9:30 am train from King's Cross. I was so excited, I love day trips and exploring new towns. It was only a 2.5 hour journey and soon we were filing into the city with all of the other tourists. It was noticeably cold, and the air smelt of gravy! I know it sounds stereotypical, but it is true. It must have come from the brewery, which was in the centre of town. 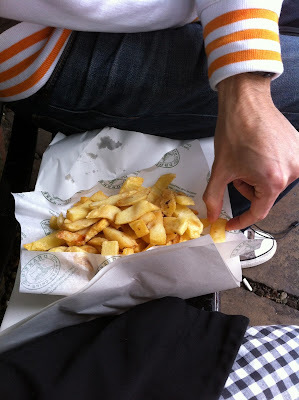 I loved it; we went round the castle walls, shuffled through The Shambles and had the BEST chip shop chips I have ever had. The smell of salt and vinegar from Drakes Fisheries had grabbed me as we walked past. We were served by a lovely friendly teen who was all smiles and good humour (not used to this in London) They were perfect - piping hot, crispy on the outside and soft on the inside. We ate them in a near by square and watched the other tourists. I enjoyed every mouthful, perfect for the chilly, Autumnal afternoon after a long journey (I may have also been nursing a slight hangover after going out with the family the night before) I know they are not healthy - but they tasted like they had been cooked up especially for that moment. They also had vegetarian options and their chips were cooked in a separate, designated pan. Naturally we visited a lot of pubs, and just before our train back we went for a meal at El Piano, a well established vegan restaurant with great reviews. We booked a table as we weren't sure how busy it would be (the town was already heaving with revellers at 5pm, all well into their pints) but the restaurant was very quiet at 6:30pm. 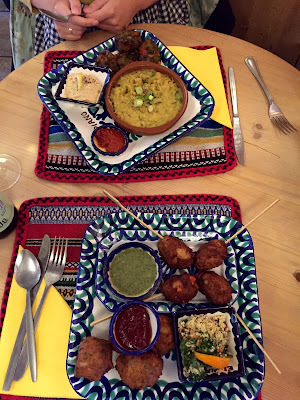 We were a bit worried as weren't very hungry (after sharing the chips and a portion of humungous onion rings at a pub) It was cosy and nicely decorated in a colourful and comforting Moroccan theme. We smelt the mouth-watering dahl as we walked in, and my mind was made up as to what to have. The waiter was really nice and made us feel relaxed, despite being the only ones there. I liked the way the menu worked: you basically choose a main dish, some fritters and a cold salad so you could mix and match to get exactly what you wanted. I went for the dahl (of course) with spinach, mushrooms and tomato pestolitos with hummus. Luke had the skewers, falafel and tabluleh. It was beautiful - I especially loved the dahl - full of garlicky flavour and not too runny. Luke said "It was really good". The portions were perfect for our present state, though I thought they would be bigger due to the price (£11.95). It is worth mentioning that they use locally sourced organic products, so it all adds up. We all eat too much anyway! I would definitely recommend a visit here if you do journey up to York one day. I had a wonderful time in York, next time I would wear more layers but otherwise do exactly the same things. Bad news - I've kust been to Drakes, and they fry their chips in beef dripping. Oh god no!! They assured me it was OK - I'm hoping it is a recent change? Why o why would a fish and chip shop use beef dripping? !